Awesome Woman - Assists empowering and creating vibrant fun in life! Create, Power, Wisdom - each essence contains a keepsake ruby! Chakras - Balances our chakras for better quality of life. Chakra 1, Chakra 2, Chakra 3, Chakra 4, Chakra 5, Chakra 6, Chakra 7, & Initiation Essences. Chakra set also includes a meditation CD. 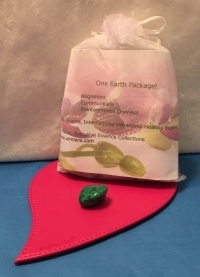 Designed to clear and balance your chakras in 20 minutes for ease of regular in-depth clearing. The CD guides you through the chakra balancing process with ease. While listening to the CD, the chakras are being balanced with the singing crystal bowls for each chakra. 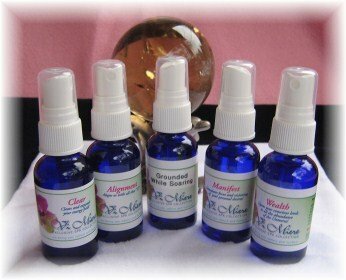 You are guided when to spray the essences for balancing of each chakra. You get sound healing as well as the essence healing for in-depth balancing. Feng Shui - Balance, clear and improve energy flow for one's space, building or home. Space Clearing, Intention Setting, Home Enhanced. Financial Leap - A great way to assist with growing prosperously! Five Element - Balance oneself with the TCM* 5 Element approach. Metal, Wood, Water, Fire, Earth. Happy Holiday - A great support set for the holidays and year round. Inner Harmony - A great way to stay peaceful during all of the holiday activities. Magnificent Man - Assists strengthening sense of self and life. Manifesting Wealth - How to shift your money story, clear out blocks in the way and open to manifesting more money flow in your life Clear, Alignment, Grounded While Soaring, Manifest , and Wealth! Oneness - Assists bringing unity to our physical, emotional and physical selves. Shining Path - Assists amplifying the light of the soul for greater expression of the spirit. Soar - How to SOAR to your next level and more with Awaken, Show Me! and Abundance! Stepping Up Your Dreams - Calmly trusting yourself as you step further into realizing your dreams.